Jindal Steel and Power Limited (JSPL) has won the Golden Bird Safety Award (Platinum) for best environmental practices and implementing workplace safety norms. 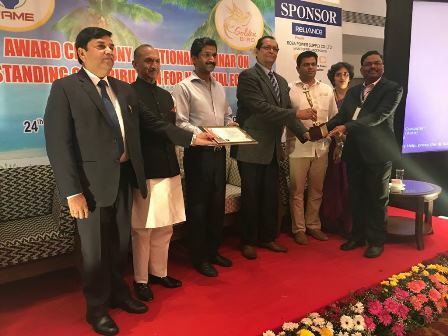 Ravi Kant Somani, Executive Vice President & Group Head (Occupational Health & Safety) and Hercules Jena, AGM (Safety) received the award given by Foundation of Accelerated Mass Empowerment (FAME), India at an event held in Goa recently. The award recognizes industries for implementing best occupational health and safety systems, processes and practices for workers. EVP and JSPL’s Barbil Unit Head G Suresha congratulated the team on winning the award. “Health and safety are not only a high priority areas for us but also an integral part of our Business. We constantly strive to put in place the best occupational health and safety system at our work premises. This award will certainly boost our effort in this direction,” said the Barbil Unit Head. The Barbil unit had won Safety Award (Gold) from Greentech Foundation of India for outstanding safety performances during 2014-15 for the second consecutive time in 2015. In the same year, the unit was conferred with International Safety Award by British Safety Council for demonstrating a strong commitment to good health and safety management during the year.